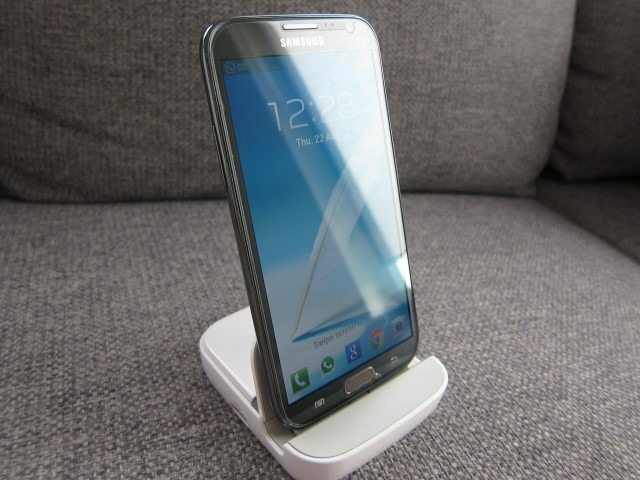 The Smart Dock is simply one of the most feature-laden docks we’ve ever seen and unlike other Samsung’s accessories which are designed for a particular device, this one should work with the Galaxy S III, S4 and the Note II. 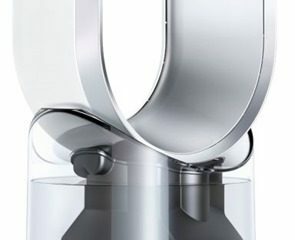 Since the stand is adjustable and doesn’t use any proprietary connections it should also fit and work nicely with future devices, which is a major plus. 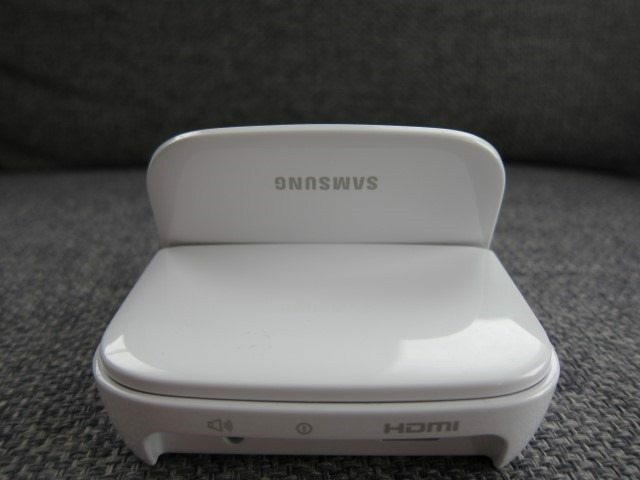 In its compact and light frame, Samsung has managed to cram in a stand, but also an HDMI port, 3 full-size USB ports, a 3.5mm audio connector and microUSB for charging and data syncing. 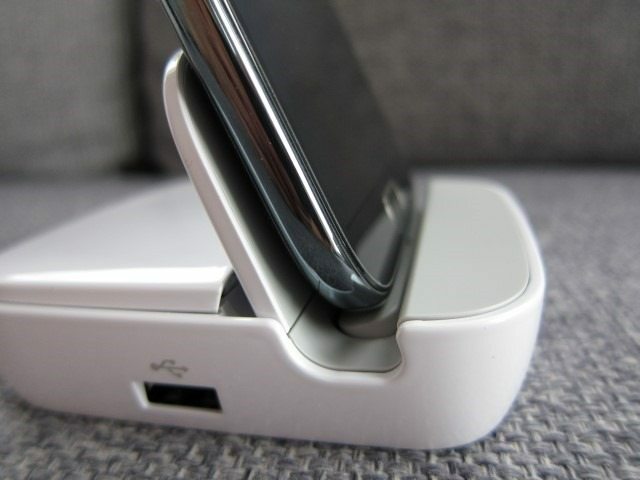 The dock is also designed in such a way that it can accommodate device with a case on. If that wasn’t enough, Samsung even includes a 2 Amp microUSB Travel Charger and USB cable, similar to what you get with the Note II and S4. Connect an HDMI display and use the USB ports for your peripherals and even external storage and you smartphone pretty much does double duty as a mini PC or even a streaming media player, similar to the Apple TV, Roku or Chromecast. Given you already have a Galaxy device, compared to the latter three, the combination of a Galaxy device with the Smart Dock admittedly has more features and offers more flexibility. But if you’re only looking for multimedia streaming, at just $35, the Chromecast still is the better value. Despite having “Smart” in its name, the dock lacks any processing power, still relying solely on your phone to control it. Without your phone it’s basically a dumb stand and charger. 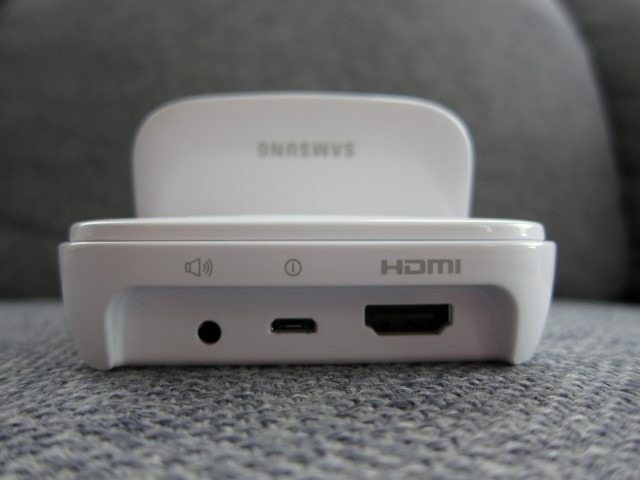 It’s similar to the Galaxy Universal Multimedia Desktop Dock, but with the added bonus of an HDMI port and 3 USB ports. 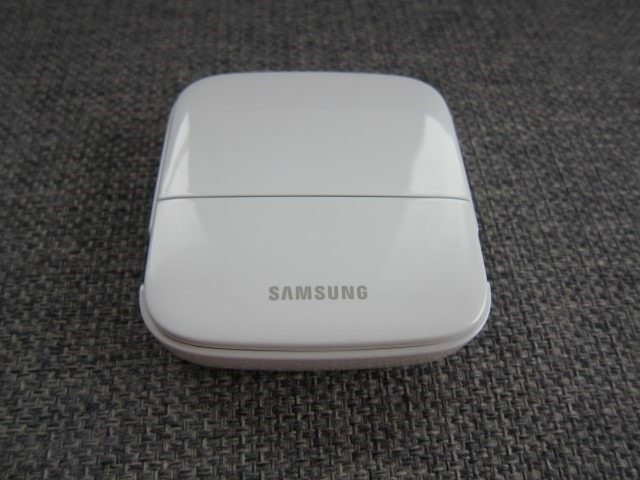 According to Samsung’s own terminology, it’s the inclusion of these ports that makes that help turn your device into a mini PC is what makes it “smart.” If you ask us, a device can be considered “smart” when it can independently can process data or perform task on its own. In this sense, the dock isn’t smart in any way. 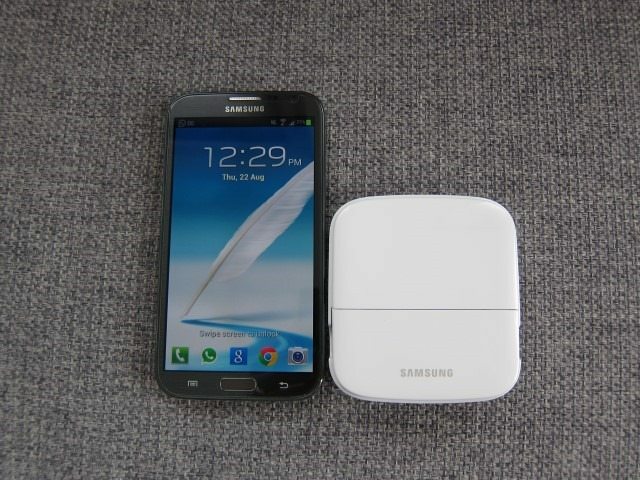 The Smart Dock only comes in White and looks a lot like the Galaxy Note II Extra Battery Kit which we’ve reviewed recently. 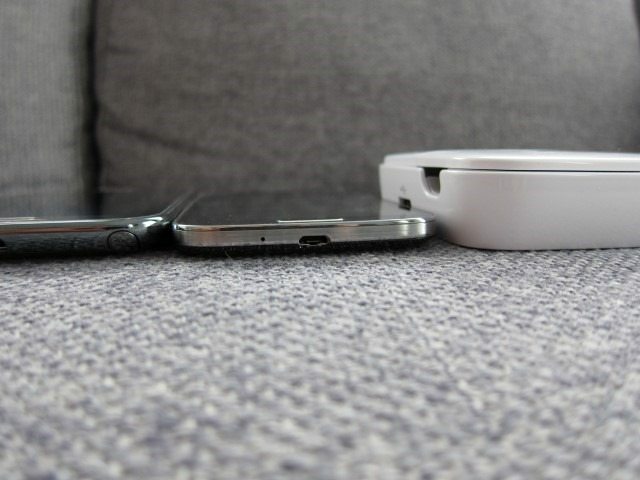 Both devices have the same finish, same basic shape, about the same footprint and a built-in stand, but the similarities end there. 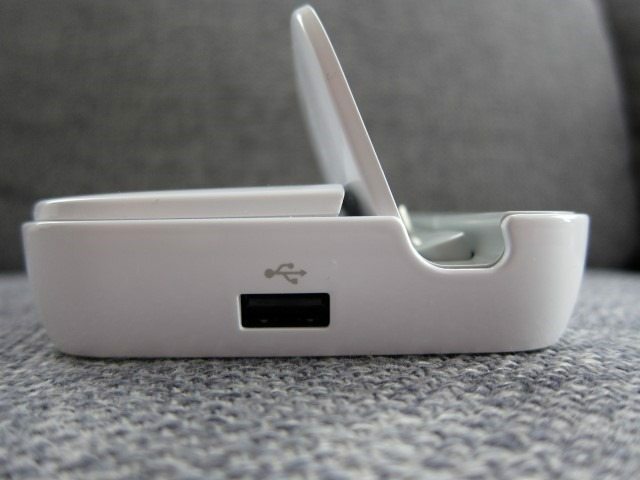 The Extra Battery Kit lacks the adjustable stand and the ability to charge and sync your device. Also missing is the 3.5mm audio jack, the “smart” features: the USB ports and the HDMI out. While you can’t charge a separate battery with the Smart Dock, it is able to charge device is charged directly. Design-wise, the EDD-S20 looks very simple, despite the various functions crammed inside. 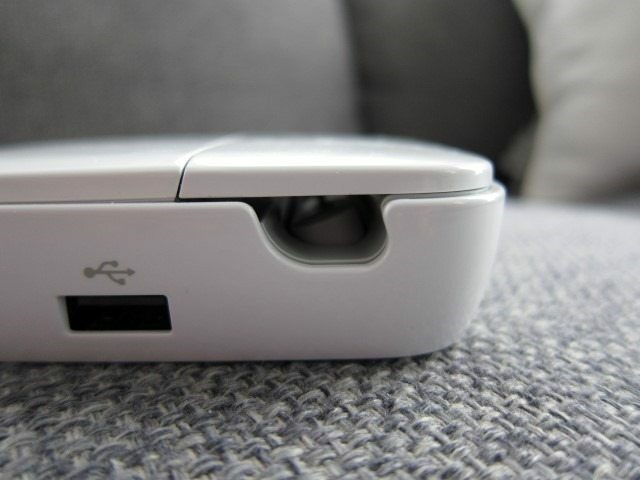 With the flap closed, it sports a glossy all-White finish. Opening the flap reveals the Grey colored innards and the built-in stand. 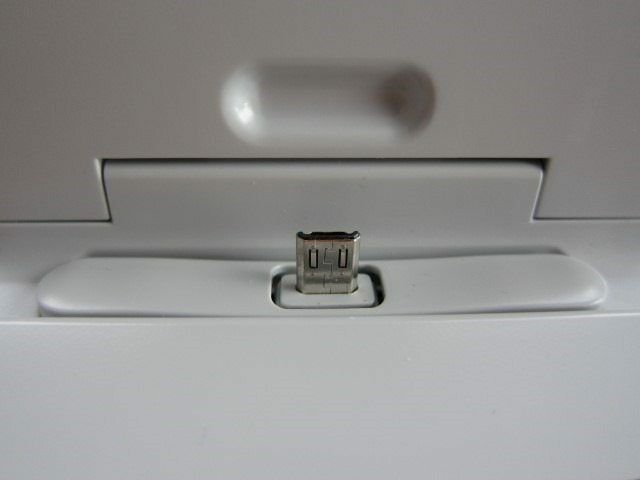 When pushed up, the flap acts like a rest to hold the device upright, while an adjustable USB connector secures the device into place. 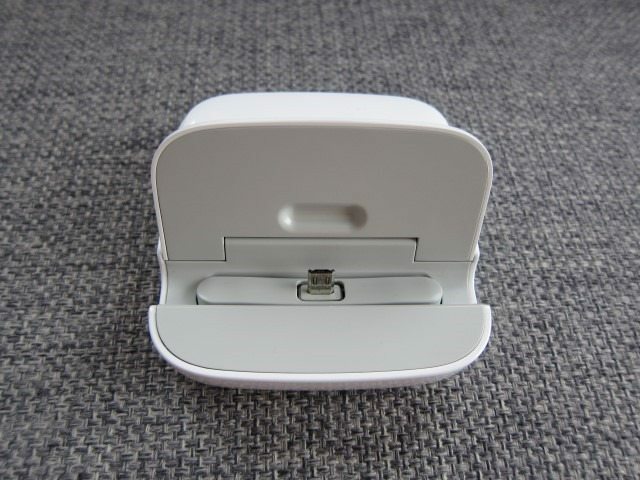 The connector is able to move back and forwards, while the spring-loaded bay where the phone rests will automatically adjust to the device’s size and weight, accommodating various phone sizes and even devices which have the case on. Opening on both sides of the flap make it easy to open, pushing it all the way to the back will lock it into place. On the left side we find the two USB ports while on the right side there’s a single USB port. On the back we find the HDMI port, USB connector and 3.5mm audio port. The device also sits on 4 rubber feet. The dock itself has a bit of a heft to it, but I suspect that weighs next to nothing, but Samsung has decided to add some weight to prevent the dock from moving around with so many cables attached. As a stand, the Smart Dock works great. The angle isn’t adjustable, but the one chosen by Samsung works great, especially when using Samsung Sidesync, Screen sharing or Kies. In this scenario the USB ports on the side and HDMI port are pretty much useless since you can already copy data to and from the device using the data cable connected to your PC. 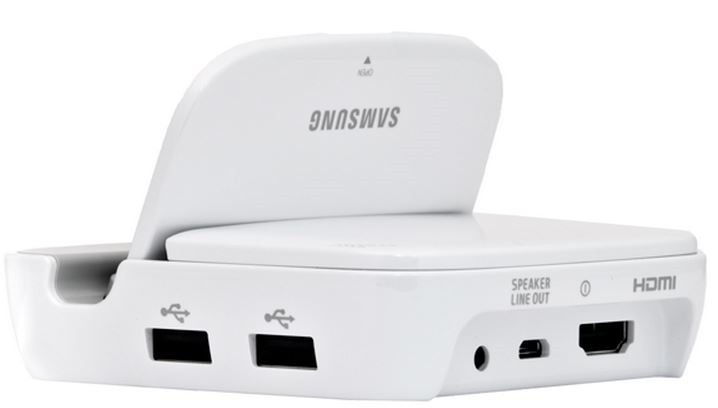 If you’re looking for a simple dock to charge and sync via your pc, the smart dock is simply overkill and you’d be better of with the cheaper Galaxy Universal Multimedia Desktop Dock. Connected to a display, with a wireless mouse and keyboard connected to it and USB thumb drive it does become sort of like a mini PC. 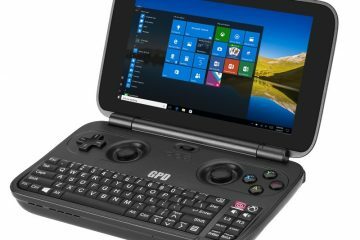 It works flawlessly without a single hitch, with the device becoming a bit warm with intense use: copying large files, while downloading in the background and playing a game. If you don’t have a smart TV, media player, console or a Google Chromecast this should work great. But the problem is that most people that would be interested in the dock’s advanced features already have one these devices mentioned and as result, the dock’s “smart” features will rarely be used. In my case I have both a PS3 and a smart TV, meaning that if I want to watch media I would use one of these two. And if I needed to use a computer, I would use my laptop and NOT my Note connected to the TV with a mouse and keyboard attached. I can, but why would I when there are easier options? This leaves these extra features for those that don’t have a console, media player or smart TV, which increasingly is becoming rare. If you’re set on sharing your phone’s screen on a display, Samsung’s AllShare Cast Dongle is the more elegant solution. The Samsung Smart Dock Multimedia Hub or EDD-S20 is a solid dock with lots of features and a hefty price. Considering it isn’t made for a specific device, is adjustable and doesn’t use any proprietary connections it should also fit and work nicely with future devices, which is a major plus and a good investment in the long run. As a stand it works great and basically we have no complaints. Despite having “Smart” in its name, the dock lacks any processing power, still relying solely on your phone to control it. Without your phone it’s basically a dumb stand and charger. 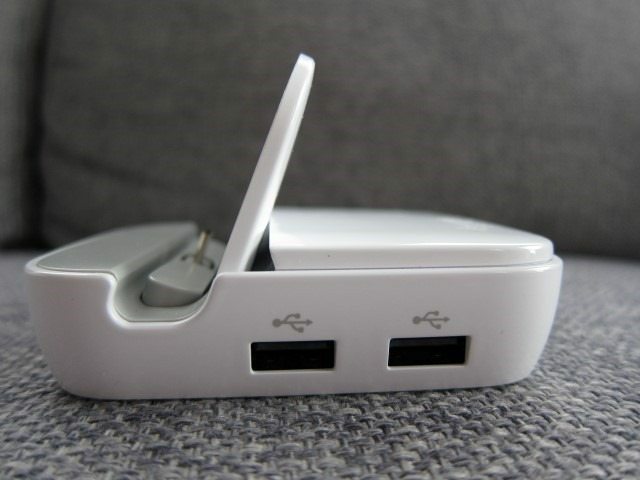 It’s similar to the Galaxy Universal Multimedia Desktop Dock, but with the added bonus of an HDMI port and 3 USB ports. The docks is actually perfect as we couldn’t find a single item to complain about: it’s a solid dock and the “smart” features that turn your device into a mini PC worked flawlessly. The issue with this dock comes from the value perspective. Most people interested in its smart features already have a smart TV, media player, console or a Google Chromecast and as result, the dock’s “smart” features will rarely be used. With this in mind, the cheaper Galaxy Universal Multimedia Desktop Dock might be better for most. If you want the best dock out there for your Galaxy device with the most features, this is it. 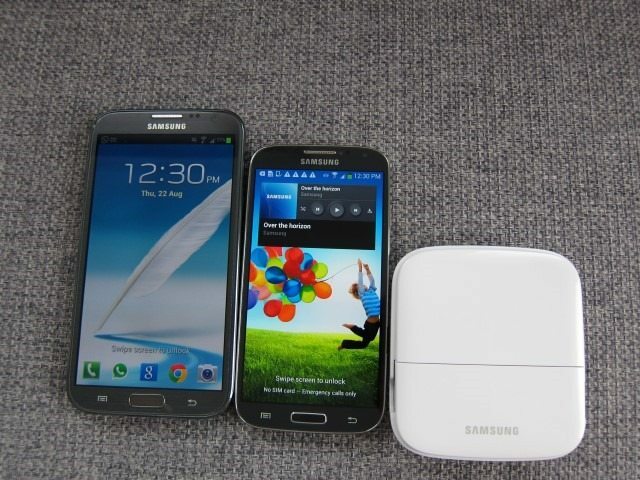 If you already have one of these media consumption devices, Samsung’s cheaper dock is the better proposition. If sharing your device’s screen on a display is important, the AllShare Cast Dongle is the more elegant solution. As a dock with some added features we give the Samsung Smart Dock Multimedia Hub an 8 out 10, but if value is important it scores a 6 out of 10.